You can add security to your account by having a list of IP addresses that can access your account. This will make sure that you can only log in from the specified IP addresses. You will not be able to log in from anywhere else besides the IP addresses that are set in the access list. 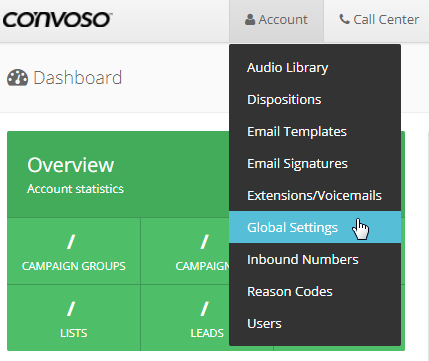 From the Admin Dashboard, click on Account and select Global Settings from the drop down menu. The IP Address will be added to the IP Access List. Once you've clicked apply changes, only the people with IP Addresses listed in the Access List will be able to access the Convoso site.